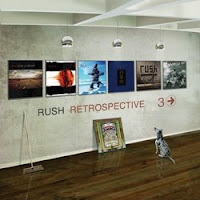 Atlas and the Anchor: Rush - "Retrospective 3 (1989-2008)"
"Don't call it a comeback". "What come around goes around". After performing last July on The Colbert Report, for their first American TV performance in 30 years and showing up to perform in the new movie I Love You, Man you can use any number of cliches to describe the fact that Rush is back in the "Limelight" again! On March 3rd, Rush released their third retrospective collection, including all of their hits and favorites from the Atlantic Records years. One of my favorites, "Roll The Bones" is included as well as remixes of "One Little Victory" and "Earthshine" by Richard Chycki, the engineer on Snakes & Arrows, who cleans up the original production to great effect. The highlight of the album is the improvisations and extended jam at the end on the live version of "Ghost of a Chance". Most casual Rush fans probably only recognize Rush from their hits from the late 70's and 80's but there are some great songs on their later albums as the Rush Retrospective III proves.